The A’eo is an endangered bird on the Hawaiian islands. but can be seen in large numbers at Kealia Ponds in Kihei, on Maui. The five year average count of these Hawaiian stilts across the Hawaiin islands is currently 3000 so they are protected and their habitats are managed to suit their breeding and feeding. Visiting the new center can be very exiting at this time of year, they are all very busy in the run up to their nesting season.. It was a wonderfully clear Maui day today. There was a gentle breeze but it wasn’t coming from the normal tradewinds direction. The West Maui Mountain horizon is usually cloudy, but todays wind direction must have blown all the clouds away. 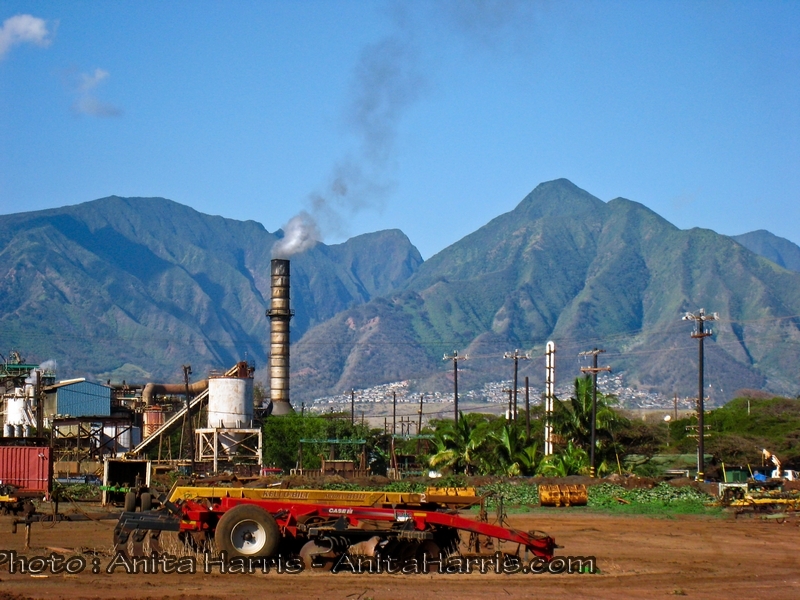 Passing by the Pu’unene sugar mill today the mountains seemed so close. So I parked in a side turning, dug out my little IXUS camera, and snapped it..
Maui Photography Book – AVAILABLE NOW from Costco Stores in Hawaii !!! 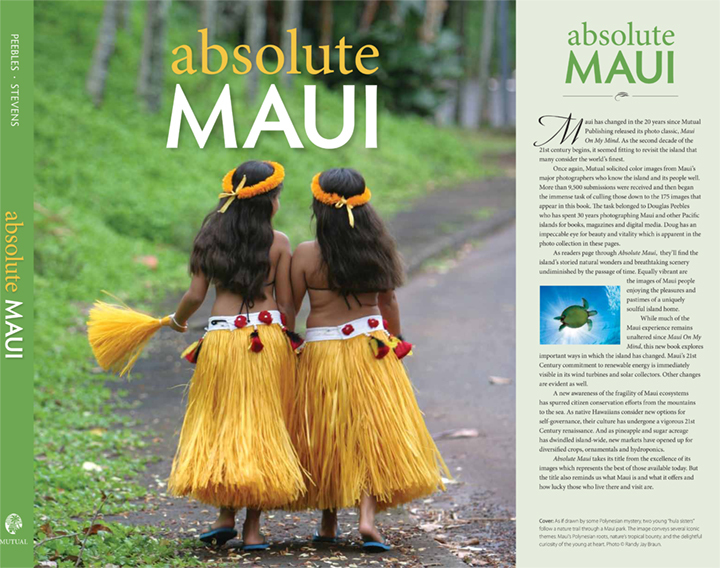 “Absolute Maui” contains 175 stunning photographs of Maui, taken by 32 photographers. We were selected from 50 photographers and our 175 images selected from 9500 photographs. “Absolute Maui” is available for purchase from Hawaiin Costco’s at a great price of $28 (RRP is $45). It will also be available from Amazon in a couple of weeks. I’ve been asked by Mutual publishing to be available at the Maui Costco store for a session of book signing along with some of the other lucky photographers on the 5th December, which is tomorrow, but I couldn’t stay away and popped in to Costco today, and met some of the other photographers who had also been successfull in getting some of their photographs published in ‘Absolute Maui’ . In these times, it is comforting to know that some things remain the same—the timeless, inspiring beauty of soulful Maui, as revealed by Absolute Maui, the first new oversized coffee table book about the island in over ten years. Absolute Maui is a photographer’s book, developed by asking Maui’s leading photographers to submit their best images that capture the look and feel of 21st century Maui. Of the more than 9,000 images submitted, 175 were selected to appear in Absolute Maui. They represent 27 Maui photographers (and four who have visited Maui frequently over the years). The photography reflects the best of the best, revealing perfect moments frozen in time, breathtaking images, scenic moods and feelings. Each image was selected because it was either splendidly colorful, masterfully composed, exquisitely vivid, sharply focused, richly detailed, or brimming over with reverence, elation, and soulfulness. Considered individually, each says something both timely and timeless about the island. Viewed collectively, the photography forms a composite portrait of Maui as seen by those best able to capture it visually—its foremost contemporary photographers. Also unique about Absolute Maui is how the images are organized. There is a Maui from an aerial perspective, a Maui from a walker’s perspective, and a nature lover’s Maui that incorporates conservation efforts. The Maui most familiar to its longtime residents is revealed in the “Maui Ways” chapter showing famous local eateries, festive fairs, parades, cowboys, dancers, and music makers. The “Hawaiian Ways” chapter of Mauians of Hawaiian ancestry imbues their cultural practices with the solemnity befitting an ancient lineage. This is one of the first-ever modern four color treatments of this theme in a Hawai‘i book. Absolute Maui was inspired by the award winning Maui On My Mind (Mutual 1985) and by Robert Wenkam’s Maui: The Last Hawaiian Place (Friends of the Earth 1971), both now considered classics. It thus provides an update to an island timeless in its beauty. Mutual Publishing, established in 1974, is one of Hawai‘i’s largest trade publishing houses.